Lock in a great price for La Quinta by Wyndham Austin Southwest – rated 8.3 by recent guests! The hotel was clean and in good shape, the grounds and surrounding area were beautiful. Location was good for us and easy access. Nice area. Grounds were lovely, and great views. Convenient to the city, yet much safer feeling than more central lodging. We looked at staying closer to the city center, but I canceled the reservation due to the apparent risks to ourselves and our vehicle. THIS hotel was secluded and well situated to offer security and protection from highway noise as well! Everything was fine friendly staff comfortable room. Great breakfast everything was fresh. The bed was very comfortable. The breakfast even had a selection of cut fresh fruit which I loved. Very pet friendly and the staff was very attentive and nice. Food just ok. Wasn't the best buffet I've ever had. La Quinta by Wyndham Austin Southwest This rating is a reflection of how the property compares to the industry standard when it comes to price, facilities and services available. It's based on a self-evaluation by the property. Use this rating to help choose your stay! Boasting an on-site outdoor pool, this hotel is 5.9 mi from entertainment on 6th Street in the Austin city center. 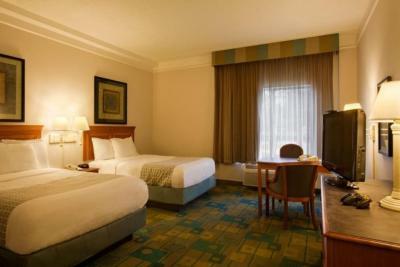 Each guest room features a flat-screen TV with premium cable channels. Tea and coffee-making facilities and ironing facilities are included in every room at La Quinta Inn and Suites Austin Southwest at Mopac. A hairdryer is provided in the private bathroom. A continental breakfast is served daily at Austin Southwest at Mopac La Quinta Inn. Guests can take advantage of free WiFi throughout the property or enjoy the on-site fitness center. The University of Texas-Austin can be reached in 15 minutes’ drive. Shopping at Barton Creek Mall is 3.1 mi from this hotel. When would you like to stay at La Quinta by Wyndham Austin Southwest? 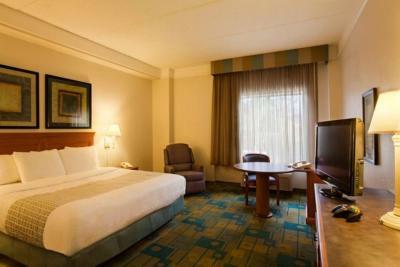 Has a flat-screen cable TV, this room also provides tea and coffee-making facilities and ironing facilities. House Rules La Quinta by Wyndham Austin Southwest takes special requests – add in the next step! La Quinta by Wyndham Austin Southwest accepts these cards and reserves the right to temporarily hold an amount prior to arrival. We have visited the facility several times in the last few years, and comparing to those last visits, this one did not live up to them. The carpet in the dining room, hallway and room could have been considerably cleaner. Plus, the carpet was fraying around some edges. Shortly after arriving I called the front desk to order more towels, but no one answered, so I went to the front desk. After calling out several times it was apparent no one was there. I stood around and waited for more than five minutes, and just when I had given up the front desk employee showed up saying they were fixing someone's TV. Do you not have staff? The room itself was awkward. The layout had double swinging doors instead of a solid door, which I had never seen in a hotel room before. The shower curtain rod had a couple of anchor bolts exposed as if the bracket supporting the rod was about to come loose. Finally, the room did not have a small refrigerator. Very disappointing all the way around. The breakfast was okay, it was the typical fair for a La Quinta. Breakfast was average. The shower leaked. The elevator was terrible. It is old and slow. It was the only elevator for 5 floors. It is clearly an older hotel. a microwave and small refrigerator would be a welcome touch. 3 bed pillows were nice. Breakfast was limited compared to other locations. the facilities were a little older than i anticipated for the price. The ac/heater was very noisy with annoying whistling sound. My daughter is allergic to dogs and developed allergic congestion after 2 nights in the room. I suggest having some rooms set aside that are not used by guests with pets. The room I occupied was well used so looked a bit shabby. Location was convenient for my purpose.